Binzasara (編木 or 板ざさら) is a traditional Japanese percussion instrument used in folk songs, and rural dances. 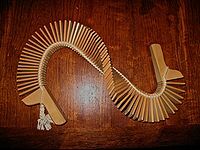 The instrument uses many pieces of wooden plates strung together with a cotton cord. With handles at both ends, the stack of wooden plates are played by moving them like a wave. ^ 東京藝術大学 , 026-binzasara, May, 2009. Wikimedia Commons has media related to Binzasara. "Binzasara: Music and Dance at Sensōji in Edo/Tōkyō"
This page was last edited on 31 December 2018, at 13:18 (UTC).